Born 1952, San Francisco, California. Nicolai Larsen is an artist, designer, mural painter internationally commissioned by public, corporate and private clients. He is known in his native San Francisco Bay Area for his inventive visionary painted imagery, fine art canvasses, award-winning large scale mural art and architectural painted environments. Nicolai studied art at the San Francisco Art Institute and the Academy of Art College. He was selected to work in the CETA Art in Public Places Project in San Mateo County, CA. Later he became a set designer at Marine World/Africa USA. 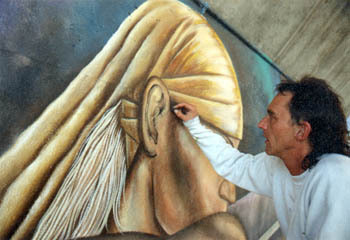 From 1982 to the present Nicolai operates his own visual arts company specializing in murals, airbrush, trompe loeil, fine arts, signs and architectural painted finishes. Recently Nicolai moved to Chico, CA where is is concentrating back on Fine Arts. He has been living in Chico now with his wife, Marion Hunziker-Larsen, their younger son and dog.